Key messages: This study highlights the presence of heavy metals impurities in skin-whitening products, but no toxicological concern for systemic toxicity is reported. The potential adverse health effects were reported from Pb exposure from the samples studied. Human is exposed to heavy metals mainly via ingestion and inhalation. Exposure through skin absorption also occurs from re-suspended particles of powder, which come from soils, or through skin contact with clothes. Nevertheless, other less obvious sources of exposure have to be considered, including the use of beauty products. Indeed, heavy metal traces can be detected in most beauty products as impurities. In Malaysia, under the Guidelines for Control of Cosmetic Products in Malaysia, Annex II listed that heavy metals including Cd, Pb, Ni, Hg and also its compound are prohibited to be used as ingredients in cosmetics because they are considered unsafe. Given that heavy metals used as intentional cosmetic ingredients has been addressed accordingly, attention is drawn to the presence of these substances as traces or impurities. In the Malaysian guidelines, it has been indicated that the presence of traces of substances listed in Annex II shall be allowed, provided that such presence is technically unavoidable in good manufacturing practice and that it comply with the Article 3 of the ASEAN Cosmetic Directive. However, concerns arise over the “technically unavoidable traces.” Several publication has pointed out that the “technically unavoidable traces” of heavy metals are rather ambiguous, subject to different interpretation and largely dependent on the technology used during the production. Thus, the presence of heavy metal impurities in the skin-lightening products especially in Malaysian market may lead to direct exposure of a large number of individuals. Heavy metals such as Ni, Cd, and Pb are common contaminants in various beauty products,,, and skin lightening is a popular beauty practice worldwide with Asia being the largest consumer of skin-lightening products. African and Latin American countries also consume high levels of skin-lightening products. The aim of this study was to assess the level of heavy metals impurities (Pb, Cd, and Ni) in skin-lightening products available in Malaysian market and to determine the dermal health risk from continued application of the creams. Facial moisturizing creams were selected as the skin-lightening samples in this study because they fulfill a broad set of performance attributes, including dryness reduction, improvement in dull appearance, and so on. The formulation also involved a handful of ingredients. A total of 33 samples of facial moisturizing creams available in Malaysian market were purchased from the outlets most preferred by consumer such as department store, beauty store, drugstore, and online purchase and convenience shop. The samples consist of 17 local manufactured creams, and 16 samples were non-local manufactured. Samples were digested using the wet digestion method. The wet digestion used four to one mixture of nitric acid (65%) and perchloric acid (70–72%). Solutions were allowed to cool and filtered into a volumetric flask (50 mL) by a filter paper (Whatman no. 42) and were diluted up to the mark with ultra-pure water. The samples were then analyzed using Inductively Coupled Plasma Optical Emission Spectrometry (ICP-OES). where m (g) is the weight tied on the upper slide, l (cm) is the length of glass slide, and t (s) is the time. On the determination of type of emulsion, the dilution test was performed. The emulsion was diluted with an equal quantity of water and the container is shaken. The oil in water emulsion dilutes in water and appear homogeneous, whereas water in oil emulsion does not dilute in water and have a nonhomogeneous appearance. Based upon the heavy metal concentration detected in the samples, in this study the health risk assessment involving margin of safety (MoS) and hazard quotient (HQ) was calculated for 49 respondents who use facial moisturizing creams. Ethical approval from the Ethics Committee for Research involving Human Subjects of Universiti Putra Malaysia (JKEUPM) has been obtained prior conducting the study. where A (g/application) is the amount of finished cosmetic product applied per application, C (%) is the concentration of ingredients under study in the finished product, and F (day-1) is the frequency of application of the substance. Margin of safety reached a value of 100 suggesting that the use of the ingredient in the products is not associated with significant risk for human health. [Table 1] lists the parameters to be included in order to determine the MoS. where ADI is the average daily intake and RfD is the reference dose. The risk calculation of average daily intake for exposure dose through dermal contact (ADID) calculation was as shown in Equation 7.
where C (mg/kg) is the chemical concentration in the exposure medium, SA (cm2) is the exposed skin surface area, AF (mg/cm2/day) is the adherence factor, ABS (unitless) is the dermal absorption factor, EF (day/year) is the exposure frequency, ED (year) is the exposure duration, BW (kg) is the human body weight, and AT (day) is the averaging time. [Table 1] lists the parameter included in determining the HQ. [Table 2] shows the heavy metal concentration and physico-chemical properties of the samples. Ni and Cd in local samples were slightly lower than non-local samples. Meanwhile the Pb concentration was significantly lower in the local sample compared to the non-local samples with Z= -2.612 and P=0.009. The moisture content level was slightly lower for local samples compared to the non-local. pH of the local samples were slightly acidic compared to the non-local samples. The spreadability of the local samples was extremely lower compared to the non-local samples. Majority of the samples were oil in water emulsion. Spreadability (Z= -3.278, P= 0.001) and type of emulsion (Z= -2.009, P= 0.044) shows significant difference between groups. [Table 3] tabulates the result of the MoS. Local samples have low MoS for Ni compared to non-local samples. However, local samples have higher MoS for Cd than non-local samples. A similar pattern was observed for Pb where MoS was higher in local samples compared to the non-local samples. [Table 4] tabulates the result for the HQ of heavy metals studied. The HQ for Ni was higher in local samples compared to the non-local samples. In contrast, the HQ for Cd was higher in non-local than the local samples. Similar to Pb, the HQ for non-local samples were higher compared to the local samples. A scientific literature proposed a value for nickel lower than 5 mg/kg as a “good manufacturing practice”. Nickel concentration in this study was within the proposed value. The highest Ni was detected as 0.7 mg/kg, which slightly lower than the “target” amount to minimize the risk of sensitization in individual sensitive to Ni (1 mg/kg). For Cd, the maximum amount of allowable Cd as impurity in cosmetics is 3 mg/kg as highlighted in Canada guideline and 5 mg/kg in Germany guideline., The Cd level in this study is within these guideline values. Though the presence of Cd in the skin-lightening creams was at a very low concentration, the slow release of Cd may cause harmful effects to the human body. Exposure to low levels of Cd over time found to cause kidney damage, bone deformity, and the ability of bones to break easily., In addition, Cd has also been shown to exert significant effects on ovarian and reproductive tract morphology even at extremely low concentration. Cd exposure during pregnancy was associated with decreased birth weights and premature birth. The maximum amount of allowable Pb as impurity in cosmetics is 10 mg/kg as in Canada guideline and 20 mg/kg in Germany guideline., Pb in this study was within the stipulated guideline values. Despite of having the recommended guideline for lead, current studies suggested that Pb may have no identifiable safe exposure level, with even the lowest levels having shown to affect the fetus and the central nervous system in children., In addition, the exposure of Pb through damaged skin was nine times higher than through intact skin and the skin decontamination with a liquid soap did not decrease the Pb skin absorption. On health risk assessment, none of the metal detected in samples shows the MoS value below 100, suggesting that there is no toxicological concern for systemic toxicity, following topical exposure toward the used of skin-lightening creams. This was consistent with study done by Marinovich et al., where the MoS value for Ni, Cd, and Pb in several types of beauty products were above 100. This indicates an appreciable risk to the consumer, following repeated exposure, assuming that all the different products are used at the same time during a make-up session. 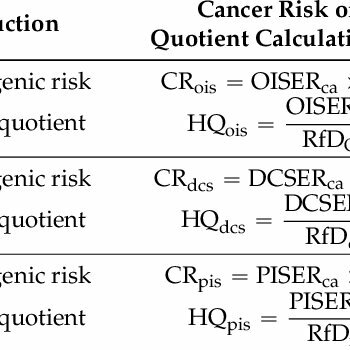 According to USEPA, the hazard quotient (HQ) cannot be translated into a probability that an adverse effect will occur, and it is also not likely to be proportional to risk but it is an indication that a potential may exist for adverse health effects. The HQ for Ni and Cd in both local and non-local samples in this study was less than 1 indicating that the exposures are likely to be without an appreciable risk during a lifetime. However, the HQ for Pb in the non-local samples was greater than 1 indicating that the exposures are likely to produce appreciable risk during a lifetime. To date, no safe blood level of Pb is known as with even the lowest levels having shown to affect the fetus and the central nervous system in children. Additionally, Pb has been found to be absorbed through the skin and dermally absorbed Pb has been evidenced to be distributed throughout the body., Therefore, this element was likely to cause harm in humans of the daily lifetime dose. In conclusion, heavy metals can be detected in most of the samples in this study. Ni, Cd, and Pb concentration were higher in non-local samples compared to the local samples. Among all heavy metals studied, only lead shows significant difference between local and non-local samples (P < 0.05). Based on the available recommended guidelines, none of the metal detected in the samples exceed the value. The heavy metals concentration detected in samples shows the MoS value higher than 100, indicating that there is no toxicological concern for systemic toxicity, following topical exposure toward the used of the skin lightening. However, the HQ value shows that Pb have HQ greater than 1 suggesting that there were potential adverse health effects due to exposure from Pb in the samples studied. Heavy metals tend to accumulate in human body and the health effects remain a concern. Mari M, Ferré-Huguet N, Nadal M, Schuhmacher M, Domingo JL. Temporal trends in metal concentrations in soils and herbage collected near a municipal waste incinerator: Human health risks. Hum Ecol Risk Assess 2007;13:457-72. Nadal M, Schuhmacher M, Domingo JL. Metal pollution of soils and vegetation in an area with petrochemical industry. Sci Total Environ 2004;321:59-69. Rovira J, Nadal M, Schuhmacher M, Domingo JL. Human exposure to trace elements through the skin by direct contact with clothing: Risk assessment. Environ Res 2015;140:308-16. Cosmetic Technical Working Group, CTWG Guidelines for Control of Cosmetic Products in Malaysia: Malaysia. 2009. Marinovich M, Boraso MS, Testai E, Galli CL. Metals in cosmetics: An a posteriori safety evaluation. Regul Toxicol Pharmacol 2014;69:416-24. Chauhan AS, Bhadauria R, Singh AK, Lodhi SS, Dinesh K. Determination of lead and cadmium in cosmetic products. J Chem Pharm Res 2010;2:92-7. Ayenimo JG, Yusuf AM, Doherty WO, Ogunkunle OA. Iron, lead, and nickel in selected consumer products in Nigeria: A potential public health concern. Toxicol Environ Chem 2010;92:51-9. Nnorom I, Igwe J, Oji-Nnorom C. Trace metal contents of facial (make-up) cosmetics commonly used in Nigeria. Afr J Biotechnol 2005;4:1133-8. Franklin I. Living in a Barbie world: Skin bleaching and the preference for fair skin in India, Nigeria, and Thailand [senior honors thesis]. California: Stanford University; 2013. 115 p.
Draelos ZD. Cosmetic Dermatology: Products and Procedures. In: Facial moisturizer. West Sussex (UK): John Wiley and Sons; 2015. p. 132-8. Hussain Ullah, Shamsa Noreen, Fozia Ali Rehman, Amir Waseem, Shumaila Zubair, et al. Comparative study of heavy metals content in cosmetic products of different countries marketed in Khyber Pakhtunkhwa, Pakistan. Arab. J Chem 2017;10:10-18. Association of Official Analytical Chemists, AOAC. Official Methods of Analysis. United States of America: Association of Official Analytical Chemists. 1990. Pandey S, Seth A, Tiwari R, Singh S, Behl HM, Singh S. Development and evaluation of antimicrobial herbal cosmetic preparation. Afr J Pharm Pharmacol 2014;8:514-28. Sabale V, Kunjwani H, Sabale P. Formulation and in vitro evaluation of the topical antiageing preparation of the fruit of Benincasa hispida. J Ayurveda Integr Med 2011;2:124-8. Hanan ZI, Durgin JM. Pharmacy Practice for Technicians. New York: Cengage Learning; 2014. 624 p.
Scientific Committee on Consumer Safety, SCCS The SCCS's Notes of Guidance for the Testing of Cosmetic Substances and Their Safety Evaluation. 8th Revision, 2012 Dec 11. Colorado Department of Public Health and EnvironmentWorking Draft: Garfield County Air Toxics Inhalation: Screening Level Human Health Risk Assessment. Colorado Department of Public Health and Environment Disease Control and Environmental Epidemiology Division: Colorado; 2007. Qu CS, Ma ZW, Yang J, Liu Y, Bi J, Huang L. Human exposure pathways of heavy metals in a Lead-Zinc mining area, Jiangsu Province, China. PLOS One 2012;7:1-11. Nduka JK, Odiba IO, Aghoghome EI, Umedum NL, Nwosu MJ. Evaluation of harmful substances and health risk assessment of mercury and arsenic in cosmetic brands in Nigeria. Int J Chem 2016;8:178-87. Basketter DA, Angelini G, Ingber A, Kern PS, Menné T. Nickel, chromium and cobalt in consumer products: revisiting safe levels in the new millennium. Contact Dermatitis 2003;49:1-7. Bundesinstitut für Risikobewertung, BfR Kosmetische Mittel: BfR empfiehlt Schwermetallgehalte über Reinheitsanforderungen der Ausgangsstoffe zu regeln, Stellungnahme Nr. 025/2006 des BfR vom 05. April 2006. Retrived from http://www.bfr.bund.de/cm/343/kosmetische_mittel_bfr_empfiehlt_schwermetallgehalte_ueber.pdf. Health Canada-Santé Canada, HC-SC Guidance on Heavy Metal Impurities in Cosmetics; 2012. Available from: http://www.hc-sc.gc.ca/cps-spc/pubs/indust/heavy_metals-metaux_lourds/index-eng.php. Bocca B, Pino A, Alimonti A, Forte G. Toxic metals contained in cosmetics: A status report. Regul Toxicol Pharmacol 2014;68:447-67. Agency for Toxic Substances and Disease Registry, ASTDR. Toxicological Profile for Cadmium. U.S Public Health Service, Agency for Toxic Substances and Disease Registry, (September); 2012: 487 p. Available from: http://www.atsdr.cdc.gov/toxprofiles/tp5.pdf. Health Canada Cadmium and its compounds. Canadian Environmental Protection Act: Priority substances list assessment report; 1994. Available from: http://www.hc-sc.gc.ca/ewh-semt/alt_formats/hecs-sesc/pdf/pubs/contaminants/psl1-lsp1/cadmium_comp/cadmium_comp-eng.pdf. Henson MC, Chedrese PJ. Endocrine disruption by cadmium, a common environmental toxicant with paradoxical effects on reproduction. Exp Biol Med (Maywood, N.J.) 2004;229:383-92. Bellinger DC. Very low lead exposures and children's neurodevelopment. Curr Opin Pediatr 2008;20:172-7. Sanders T, Liu Y, Buchner V, Tchounwou PB. Neurotoxic effects and biomarkers of lead exposure: A review. Rev Environ Health 2009;24:15-45. Centers for Disease Control and Prevention. National Report on Human Exposure to Environmental Chemicals: Fact Sheet (Lead); 2010. Available from: http://www.cdc.gov/exposurereport/Lead_FactSheet.html. Sprinkle RV. Leaded eye cosmetics: a cultural cause of elevated lead levels in children. J Fam Pract 1995;40:358-62. Rastogi SC, Clausen J. Absorption of lead through the skin. Toxicology 1976;6:371-76. Lilley SG, Florence TM, Stauber JL. The use of sweat to monitor lead absorption through the skin. Sci Total Environ 1998;76:267-78. Agency for Toxic Substances and Disease Registry, ATSDR Glossary of Terms; 2016. Available from: http://www.atsdr.cdc.gov/glossary.html#G-P.